Yesterday I made some pretty amazing cupcakes. Okay you're thinking, calm down with the arrogant claims; but I'm telling you, I can hardly stop myself stuffing my face with the lot of them. Lovely and moist, with a distinct but subtle - almost marmalade - flavour they are pretty much everything I like in a cake. The inspiration for them came via a rather circuitous route. I noticed a picture of a lovely looking bundt cake on Instagram and the baker @modernhaus was raving about it. She said that the recipe had been for an orange cake but she'd used satsumas instead. Suddenly mindful of the glut of clementines sitting in my fruit bowl I went on the hunt for the recipe but to know avail. And then, a couple of hours later, under another photo of this temptingly good-looking cake, some kind soul posted a link to the recipe. Don't you just love the interwebs? Anyway, as usual I was reluctant to stick to the recipe as written and decided to mix the ingredients up a bit and make cupcakes instead. For me cupcakes are pretty much the ideal sweet snack. I couldn't care less how fashionable they are or whether I'm meant to have thrown them over for cake-pops or whoopee pies. To my mind a cupcake is the perfect size for an afternoon treat that leaves you satisfied but not stuffed. I also like the fact that they can be taken into work and distributed without the need for knives and plates. 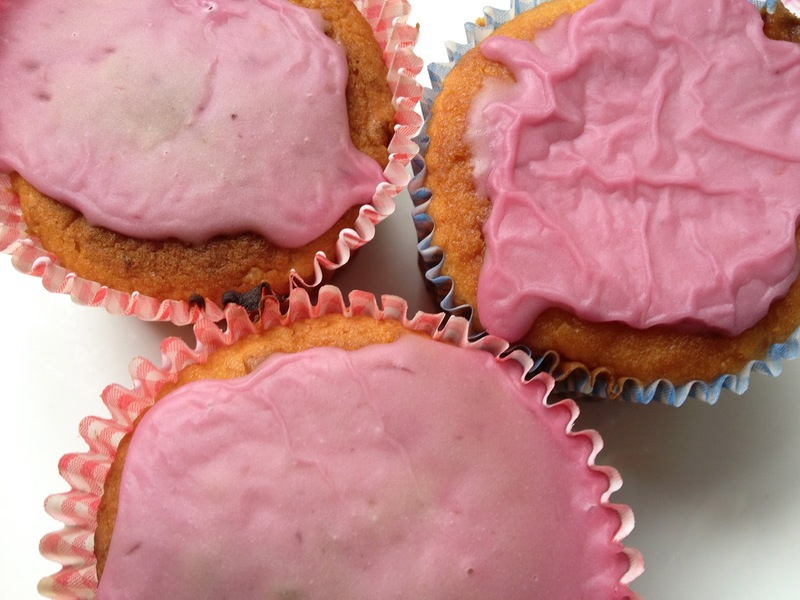 Although I warn you, you may not be minded to take these cupcakes anywhere as they're so bloomin' delicious! You may notice, by the way, that I have opted for neither a buttercream nor a fondant topping. The original recipe called for drizzled icing so I did my own, rather thicker, version of that. It turned out to be fairly perfect for me as I tend to get a bit overwhelmed by a lot of sweet topping on my cakes. I've always steered-clear of a drizzle for cupcakes but having tried it once I will definitely be doing it again. And using blood orange juice gives it this fantastic pink colour without the need for any nasty artificial ingredients. Worth bearing in mind for all sorts of recipes. Finally, although I find it's entirely possible to do most things without the aid of expensive kitchen gadgets, I think it'd be pretty difficult to prepare the clementines for this recipe without a food processor or good stick blender.